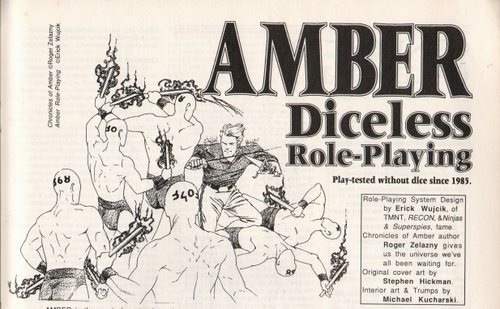 "AMBER is the most character intensive game ever! It takes hours, plus a whole gaming session, just to create a new group of Amber player characters. Amber Characters start out with the strength to lift a car, the endurance to fight a whole day without tiring, a mind trained to psychic combat, and the battle skills of a master. Better yet, they start out as fully rounded people. Character building starts with players competing in an Attribute Auction, using their character's points to vie for dominance in psyche, strength, endurance and warfare. Then players use their points to get Powers. Pattern is the ticket to immortality, the birthright of any Amberite, and the ultimate key to controlling worlds. You see, our Earth is but one of an infinite number of Shadows, cast by the light of the only true world, Amber. Player characters with Pattern have the blood of Amber's ruling family. This means being able to walk among infinite alternate reality, shaping or destroying, to toy with destiny. The flip side of Pattern, it's opposite, is the power of the Logrus, symbol of Amber's great foe, the Courts of Chaos. Between these two powers are the lesser abilities of Magic, Shape Shifting and Trump. 1. Characters are made with points, bidding in an Attribute Auction where the players compete for Rank. NO DICE! 2. Combat is resolved by comparing each combatant's Rank and specific actions. The best character wins! NO DICE! 3. Players choose their own "LUCK," spending points to be lucky, or borrowing point against bad luck. NO DICE! 4. Ever been frustrated with a bad dice roll? 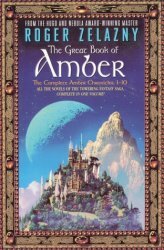 In Amber, if your character can do it, consider it done! NO DICE! 5. No Random encounters! Instead, each character is part of a story, and encounters are planned by the GM! NO DICE!" - an advertisement from Dragon Magazine #174, page 73. 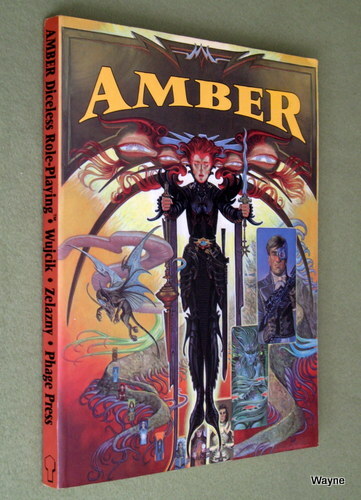 "Designed by Eric Wujcik, based on Roger Zelazny's Amber. 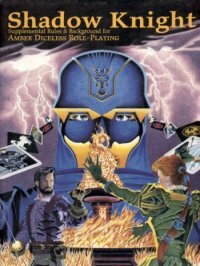 • A Complete new role-playing system! 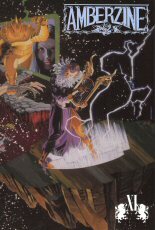 • Three complete adventures, including "Throne War," "Battleground on Shadow Earth" and "Into the Abyss!" • Attribute Auction system where players bid against each other, creating a unique family of immortals! • Enter a universe where Pattern lets you "walk" to any world you can imagine, where Logrus tendrils can reach across infinite dimensions, and where Shape Shifting lets characters sprout wings! • A mature, demanding, and time-consuming system that puts character development above all else! • Over 100 pages of tips on role-playing style and technique with dozens of crystal-clear examples!" 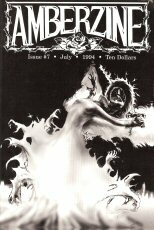 "Ken Alves * Chuck Knakal * Henry Kuttner * Kevin Lowry * Carl Yoke * Ray Bradbury * Michael Kucharski * Jane Lindskold * Nina Paley * Roger Zelazny"
"This issue... Solomon Foster • Juli A. Halbur-Herrera • Sarah Bear Kindred • Michael Kucharski • Leslie Lightfoot • Wendi Strang-Frost • K. Michael Thomas • Elizabeth S. Ray Trumitch • Jennifer A. Woelke"
Ken Alves • John Betancourt Amelie Belcher • Karen Brazil • Cody Collins • Genevieve Cogman • Simone Cooper • Lizete De Assis • Carol Dodd • Jason Durall • David W. van Dyche • Melissa Garber • Melissa Gay • Ed Greenwood • Amanda Heroman • Matt Howarth • Bryan Ingham • Chris Kindred • Cathy Klessig • Michael Kucharski • David Lihard • Jane Lindskold • Terry O'Brien • Bridgette Ruggles • Pierre-Alexandre Sicart • Boris Sirbey • Walter Jon Williams • Cliff Winnig • Todd E. Worrell • Erick Wujcik • Carl Yoke • Roger Zelazny • Trent Zelazny"
"Roger Zelazny's books have three things in common: a flawed hero who sometimes fails, endlessly surprising plot twists, and a blend of lyricism, literary allusions, and sly puns that makes the pages fly. 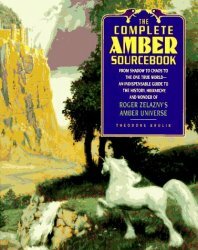 The Great Book of Amber, collecting all 10 Amber novels, is vintage Zelazny. Despite some irritating typographical errors, it's invaluable for anyone who wants to read or reread the tales of Corwin and his son, Merlin. Corwin is a prince of Amber, the "immortal city from which every other city has taken its shape." All other worlds, including Earth, are shadows of that reality. Corwin has spent centuries on Earth as an amnesiac. But when someone in the family tries to kill him there, Corwin begins a search for his past. He quickly learns that his family has some very unusual powers. They can travel between Amber, its shadows, and Chaos by manipulating reality; use magical playing cards to communicate and travel instantaneously; and are able to walk the Pattern that created Amber. Corwin regains his memory, solves the mystery of his father Oberon's disappearance, and fulfills his destiny--only to disappear into Chaos. •Everything Amber, from Arkans to Zhind. •The culture, customs, language, and laws. •An in-depth genealogy of the ruling family — a rogues' gallery of royal friends and lethal foes. 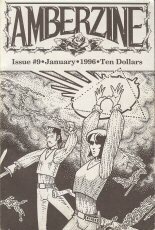 Plus much, much more: the Shadow worlds, the Amber cards and symbols, the Ghostwheel and the Patterns, Amber's calendar, fashions, fads, and major occurrences... and, of course, Chaos. THE SECRETS, THE TRUTH, THE MAGIC, AND THE MYTHS - THE GATEWAY IS OPEN TO THE ONE TRUE WORLD." "What you hold in your hand is nothing less than a ground-breaking experiment in graphic science fiction. Each of the five fantasies in this book are developed in a different way. At least two systems of graphic storytelling have never been seen before in this country. 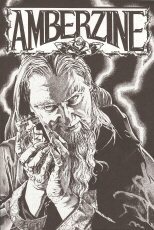 The Illustrated Zelazny is a high quality effort to move the framework and focus of the graphic story in new and more sophisticated directions. At the same time, this book is intended to be fun for the reader. Hopefully you'll get a kick out of the visual tricks played within it. 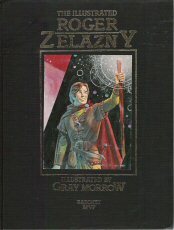 With the exception of "Shadowjack," an original story scripted just for the book, all of the tales here are well-loved Roger Zelazny standards. "A Rose for Ecclesiastes," which Gray Morrow has illustrated in magnificent color, is an intricate and sensitive fantasy about the first Earth poet on Mars. "The Doors of His Face" is an adventurous tour de force, an epic sea hunt on another planet "The Furies" is Roger's hat trick; philosophical, mythical and straight heroic fantasy mingled with four very different yet strangely sympathetic characters. Ted Sturgeon has said it leaves you "gasping with a fable in your hands." Both Roger and Gray possess a special sense of the fantastic. If the work in this book doesn't leave you gasping, then at least you'll laugh, smile or nod your head with an enthusiastic "Yeah!" 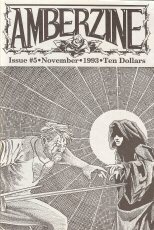 So be prepared for over 60 pages of color and a score of sensational black-and-white..."
"It is said that there are no wonders and no horrors save those that man has brought upon itself. It is said that butterflies were born of blind evolution and insensate Nature, that the sky is but a screen of molecules between humanity and the endless void. It is said that the highest form of life is man. People have looked for more, scientists and artists reaching for some hidden magic. They have found none... but it is there. Hidden in the Secret Places, a twist of space away from the Earth that hosts them, are the Imperators Occulte: the true gods, the banished angels, the great Lords of the Dark and of the Light. Beyond the edge of the Earth is the World Ash, that holds all the worlds there are. Its tender heights support Heaven. Its roots trail into Hell. And in a certain place where no mortal man has been, those branches twine and tie together to support the graves of angels, where the yellow chrysanthemums grow. Nobilis is set between Ash and Chrysanthemum, in the world these flora bracket — in a world where flowers are the symbols of the oldest game of all. It is the story of the 'Sovereign Powers,' shard-selves of the Imperators charged to act in their Lord or Lady's name. Do not be mistaken: these are no mere servitors. Alone, with none of their kind to aid or oppose them, any of these Powers, these Nobilis, could tear down a nation, or earn its worship. They are called cruel, these Nobilis. They are called soulless, or soul-twisted, and this last is true, for the divine essence of an Imperator burns its way into its shard-selves' souls. They have been called glorious and they have been called evil; they have been called slaves and they have been called Lords. Call them, instead, human. Humans caught inside when a Secret Place was built, when an Imperator chose the bodies and minds that would hold its aspects. Humans tied, now, to the elements of reality itself, and charged with the terrible responsibility of guarding those elements. Humans tied, now, to their Chancel, their Secret Place, and charged with its defense and rule. These may not seem to be difficult duties -but there is a war going on at the edges of reality, and the Imperators are all that hold the Excruclans back. Every Power knows this, as well: sometimes this war comes to Earth. And when it does, it Is their problem alone. The other players in the game of flowers are Nobilis too." "UNWILLING GODS. IMPOSSIBLE POWERS. UNEARTHLY DANGERS. BEYOND THE SKY, THE WORLD ASH STRETCHES FROM HELL TO HEAVEN, SUPPORTING COUNTLESS WORLDS BESIDES OUR OWN. BETWEEN THESE STRANGE REALMS, DIVINE POWERS AND THE WILD FIGHT A WAR TO CONTROL AND DEFINE THE WHOLE OF EXISTENCE, ONE IDEA AT A TIME ... OR TO UNMAKE IT ALTOGETHER. THE NOBILIS STAND IN THE FRONT LINES OF THIS CELESTIAL STRUGGLE. ONCE THEY WERE HUMAN. NOW THEY ARE SOMETHING MORE, EACH INFUSED WITH A PIECE OF CREATION'S POWER AND GIVEN MASTERY OVER ONE PART OF REALITY. LOVE, WAR, MUSIC, STEEL, THUNDER, AGONY OR ANY OF INFINITY'S COMPONENTS: A NOBLE IS ITS INCARNATION, MASTER AND PROTECTOR. 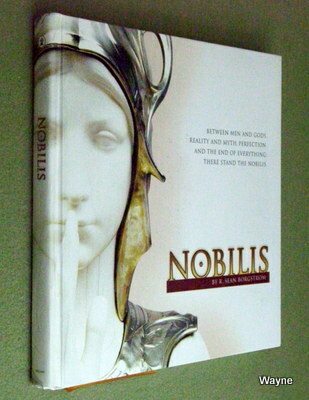 NOBILIS LETS YOU BE ONE OF THESE GUARDIANS OF REALITY. THE GAME COMBINES FIERCE IMAGINATION AND THE TRANSCENDENT POWER OF GODS TO CREATE INTENSE ROLEPLAYING EXPERIENCES, FROM THE UNSEEN MYSTERIES OF THE UNIVERSE TO THE DEPTHS OF THE HUMAN HEART. THIS BOOK CONTAINS COMPLETE RULES, DETAILED BACKGROUND, DESCRIPTIONS OF HOW TO PLAY THE GAME AND ADVICE ON HOW TO REFEREE IT, PLUS PROFILES OF THE NOBILIS, AND A COMPLETE SAMPLE CAMPAIGN. 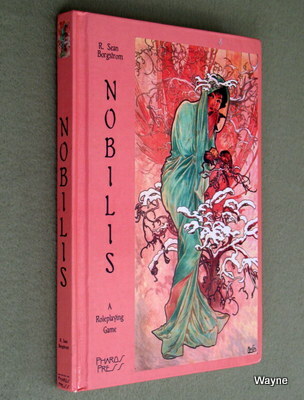 NOBILIS: A ROLEPLAYING GAME BY R, SEAN BORGSTROM. 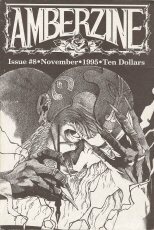 WITH ART BY CHARLES VESS, BRYAN TALBOT MICHAEL KALUTA, LEE MOYER, RAVEN MIMURA, RIK MARTIN, MARTIN McKENNA, FRAZER IRVING, RALPH HORSLEY, DENISE GARNER, AL DAVISON, AND ARCIMBOLDO." "In Nobilis, players take on the roles of the Sovereign Powers, each the personification of one single aspect of reality: night, roads, ecstasy, chains, time, water - whatever the players can conceive of. Once human, each character has been forever changed, imbued with awesome power and terrible responsibility. 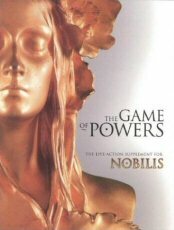 The Game of Powers expands the worlds and rules of Nobilis, moving play away from the tabletop and into live action."